17" Blue Medium Duty Scrubbing Pads FREE! 1/2" to 3/8" O.D. Solution Tank Hose Conversion Kit FREE! This commercial floor scrubbing package is great for the novice and professional alike. It comes with a 17 inch 175 RPM low speed floor buffer, a shampoo tank, 4 gallons of a lavender floor cleaning solution, 2 cases of red buffing pads - included for free, and 2 cases of blue scrubbing pads - included for free. Basically this package comes with all the necessary accessories for you to scrub any hard flooring surface like a professional. The shampoo tank allows you to dispense solution as you scrub, saving time! This polished body floor machine looks professional, and will leave the same shine on your floor that you see on the machine itself. Not only can it be used to do some low speed spray buffing/polishing, but it can also scrub and strip any hard floor surface. Almost all of our other rotary scrubbing buffers can accomplish these same tasks, but no other machine will pass on the value and power per dollar spent, as this CleanFreak floor polisher. Plus it looks truly professional with its highly polished sheen! A gravity fed stopper, when pulled, will dispense the solution down to the apron of the machine, allowing you to scrub any type of surface continuously. A multi-purpose solution for cleaning hard floors and flat surfaces. Leaves behind a fresh lavender smell to leave your facility smelling clean and inviting! Ideal for use in kitchens, schools, hotel rooms, lobbies, entrances and other public areas. 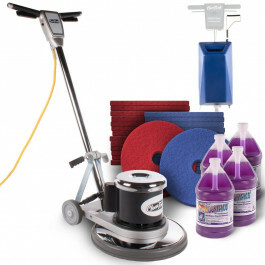 Great for wet medium duty scrubbing on any smooth hard floor surface! Great for wet light duty scrubbing on any smooth hard floor surface. This kit converts the 1/2 inch hose into a 3/8 inch hose which is needed to hook this tank up to this 17 inch machine. Customers who were interested in the Commercial Floor Buffer Cleaning Package were also interested in the following items. When I opened the large, heavy box containing my new machine, the handles were broken. I thought what a mistake, how am I going to return this piece of crap. However, customer service gave me an option of sending a new handle unit to change out, or having the machine picked up and returned. I chose the handle unit, and changed it out myself. It was easy, straight forward, and best of all, the machine works fine now. I always judge people and companies by how they respond to problems occur, and the CleanFreak machine is good for large hard floor spaces, and they proved themselves resolving a problem. Great package. Has everything I need. Heavy duty machine. package is a great value. This is a review for the Commercial Floor Buffer Cleaning Package.